When Jessica and I decided to plan a baby shower for a friend at work, we took our inspiration from the bedding she had selected for her sweet little boy. It was a gorgeous, nautical like plaid that drew from many primary and classic color sources. So, we decided to go with an all nautical baby shower. I have a few small details I am going to share with you from the shower today. They are all "take-away" decorations, meaning we hoped they could be useful in the sweet baby's room someday. The first thing I did was run out to my local craft store. In an unlikely coincidence, I found these awesome styro-foam sail boats discounted to 25 cents each! What a steal. 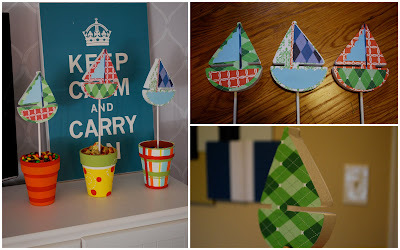 So, I took them home, gussied them up with some scrap book paper, stuck them on a dowel rod and planted them in candy. I was tickled pink (or blue I should say?) with the results! We also painted simple ceramic terracotta pots to match sweet baby's bedroom (hoping our friend could find a use for them in the decor someday.) 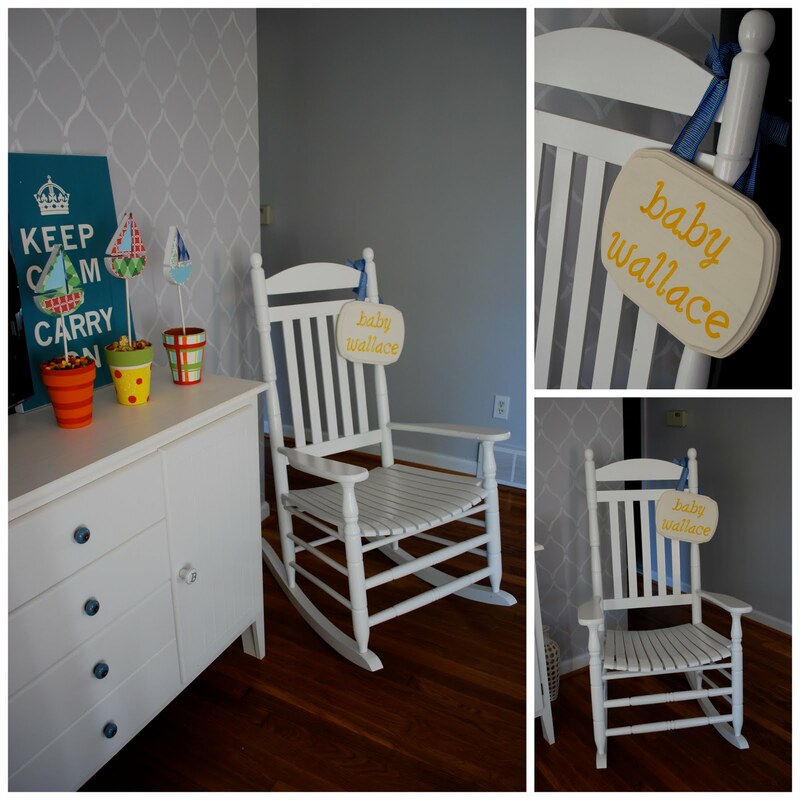 Another simple, yet personalized detail for the shower was a sign for the sweet baby. Taking colors from the bedding, I personalized an inexpensive wooden plaque and hung it on the rocking chair where the mommy to be was to sit. This was another decoration we thought could be used someday in sweet baby's room. Finally, another take-away decoration was the numbered picture clips. You might remember these way back when from an Easter post I did. I simply bought dowel rods, a holder and some wooden numbers that I painted white. I then made a little sailboat bottom from a white gift box, and wrote the baby's name on it. 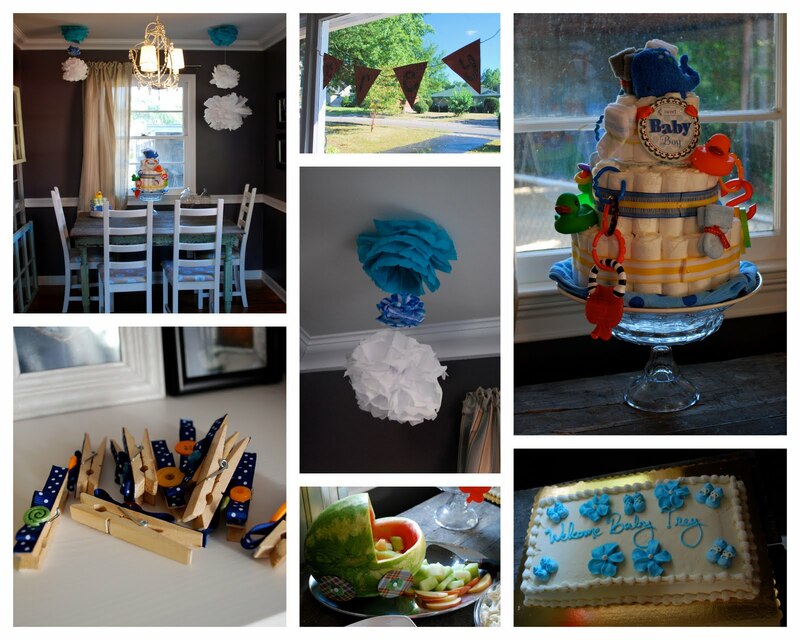 We used sweet ultrasound pictures to personalize for the shower, along with a removable scrapbook paper sail boat. There are plenty of holes to add numbers for baby pictures all the way to month 12! It was a bright, cheery shower to decorate for. I'll share pictures of some other finishing touches to leave you with. Most of which were created by the wonderful Jessica. She is a great party planning partner. In fact, I can't wait to help her more with her upcoming Halloween party, it will be too much fun! I'll be linking to these parties this week. Enjoy! Love how you interpreted the theme! I love the theme! 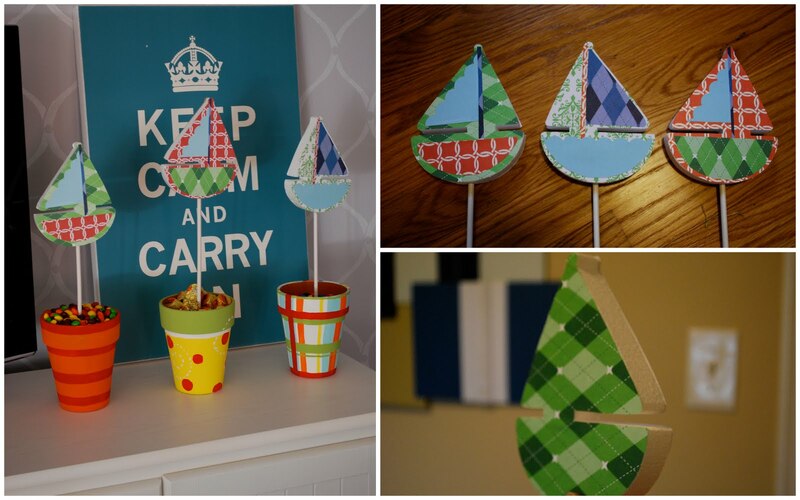 Those decorations are adorable, and I love how it all could be used in the room, great job! !